Flavius Josephus describes the destruction of Jerusalem. 1. Josephus is one of the most famous historians of the Judeo-Christian Bible. 2. Writing in about 110 AD, Josephus recorded, in great detail, Jewish history, 1st century Judaism, the ministry of Jesus. 3. In a book called, "Wars of the Jews", Josephus describes the destruction of Jerusalem as Jesus prophesied in Matthew 24. 4. Initially most people who believe in the Rapture have such a poor knowledge of the bible, the first time they learn this historical fact, is when they read it here on our Rapture Refuted website! At first they suffer from denial. Then they are confused when they are unable to deny this historical record. 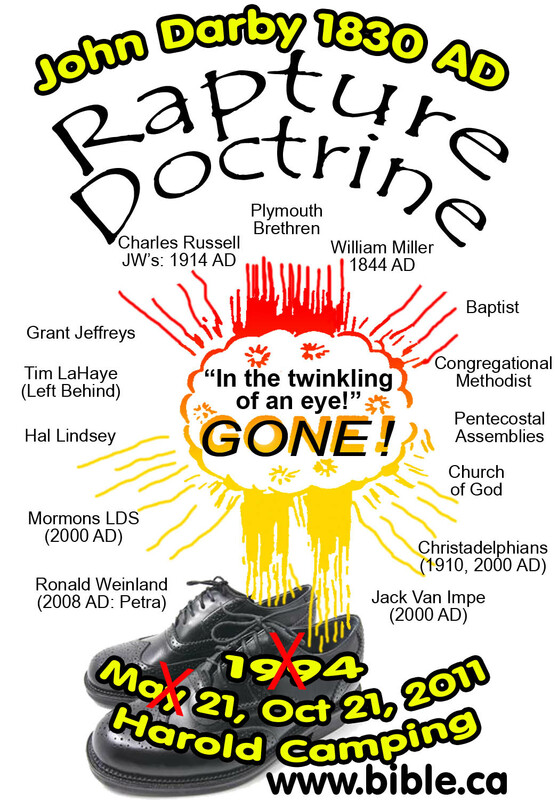 Finally they invent the double prophecy argument, namely that Mt 24 prophesies 70 AD and the second coming. 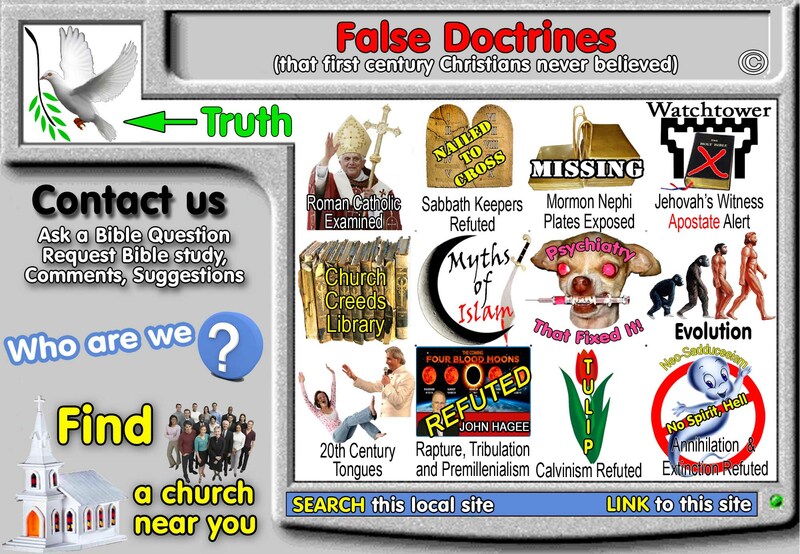 This of course is pure fantasy because none of the signs of Matthew 24 are of the second coming. 7. 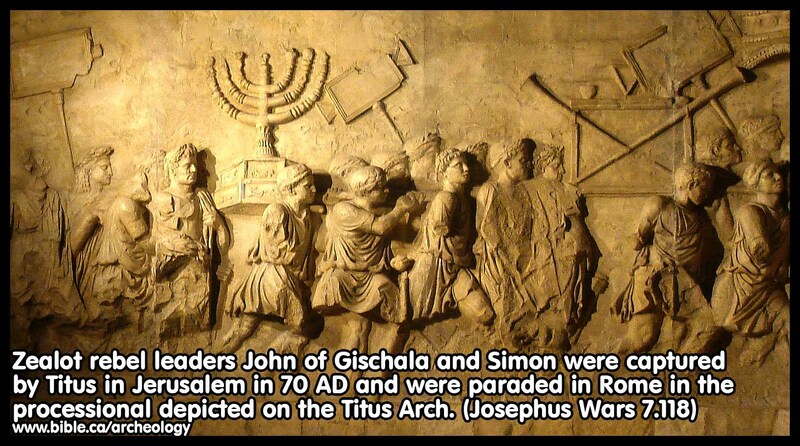 Of course, there is lot of archeology that prove Matthew 24 was fulfilled in 70 AD, like the Titus Arch, which is a Roman celebration monument in Rome of Titus carrying the contents of the Temple in Jerusalem back Rome. The sounds of a great multitude saying, "Let us remove hence." Prophetic Significance of Jewish War. 6. These works, that were done by the robbers, filled the city with all sorts of impiety. And now these impostors and deceivers persuaded the multitude to follow them into the wilderness , and pretended that they would exhibit manifest wonders and signs, that should be performed by the providence of God. And many that were prevailed on by them suffered the punishments of their folly; for Felix brought them back, and then punished them. Moreover, there came out of Egypt about this time to Jerusalem one that said he was a prophet , and advised the multitude of the common people to go along with him to the Mount of Olives, as it was called, which lay over against the city, and at the distance of five furlongs. He said further, that he would show them from hence how, at his command, the walls of Jerusalem would fall down; and he promised them that he would procure them an entrance into the city through those walls, when they were fallen down. Now when Felix was informed of these things, he ordered his soldiers to take their weapons, and came against them with a great number of horsemen and footmen from Jerusalem, and attacked the Egyptian and the people that were with him. He also slew four hundred of them, and took two hundred alive. But the Egyptian himself escaped out of the fight, but did not appear any more. And again the robbers stirred up the people to make war with the Romans, and said they ought not to obey them at all; and when any persons would not comply with them, they set fire to their villages, and plundered them. Introduction To Extremities - the "greatest of all those .. ever heard of." 4. However, I will not go to the other extreme, out of opposition to those men who extol the Romans, nor will I determine to raise the actions of my countrymen too high; but I will prosecute the actions of both parties with accuracy. Yet I shall suit my language to the passions I am under, as to the affairs I describe, and must be allowed to indulge some lamentation upon the miseries undergone by my own country; for that it was a seditious temper of our own that destroyed it; and that they were the tyrants among the Jews who brought the Roman power upon us , who unwillingly attacked us, and occasioned the burning of our holy temple; Titus Caesar, who destroyed it, is himself a witness, who, during the entire war, pitied the people who were kept under by the seditious, and did often voluntarily delay the taking of the city, and allowed time to the siege, in order to let the authors have opportunity for repentance. But if anyone makes an unjust accusation against us, when we speak so passionately about the tyrants, or the robbers, or sorely bewail the misfortunes of our country, let him indulge our affections herein, though it be contrary to the rules for writing history; because it had so come to pass, that our city Jerusalem had arrived at a higher degree of felicity than any other city under the Roman government, and yet at last fell into the sorest calamities again. Accordingly it appears to me, that the misfortunes of all men, from the beginning of the world, if they be compared to these of the Jews, are not so considerable as they were; while the authors of them were not foreigners neither. This makes it impossible for me to contain my lamentations. But, if any one be inflexible in his censures of me, let him attribute the facts themselves to the historical part, and the lamentations to the writer himself only. 11. After this, I shall relate the barbarity of the tyrants (the seditious Jews within Jerusalem - TD) toward the people of their own nation, as well as the indulgence of the Romans in sparing foreigners; and how often Titus, out of his desire to preserve the city and the temple, invited the seditious to come to terms of accommodation. I shall also distinguish the sufferings of the people, and their calamities; how far they were afflicted by the sedition, and how far, by the famine, and at length were taken. Nor shall I omit to mention the misfortunes of the deserters, nor the punishments inflicted on the captives; as also how the temple was burnt against the consent of Caesar; and how many sacred things that had been laid up in the temple, were snatched out of the fire; the destruction also of the entire city, with the signs and wonders that went before it ; and the taking the tyrants captive, and the multitude of those that were made slaves , and into what different misfortunes they were every one distributed. Moreover, what the Romans did to the remains of the wall; and how they demolished the strong-holds that were in the country; and how Titus went over the whole country, and settled its affairs; together with his return to Italy, and his triumph. 1. This advice (from Agrippa - TD) the people hearkened to, and went up into the temple with the king and Bernice, and began to rebuild the cloisters: the rulers also and the senators divided themselves into the villages, and collected the tributes, and soon got together forty talents, which was the sum that was deficient. And thus did Agrippa then put a stop to that war which was threatened. Moreover, he attempted to persuade the multitude to obey Florus, until Caesar should send one to succeed him; but they were hereby more provoked, and cast reproaches upon the king, and got him excluded out of the city; nay, some of the seditious had the imprudence to throw stones at him. So when the king saw that the violence of those that were for innovations was not be restrained, and being very angry at contumelies he had received, he sent their rulers, together with their men of power, to Florus, to Cesarea, that he might appoint whom he thought fit to collect the tribute in the country, while he retired into his own kingdom. 2. And at this time it was that some of those that principally excited the people to go to war, made an assault upon a certain fortress called Masada. They took it by treachery, and slew the Romans that were there, and put others of their own party to keep it. At the same time Eleazar, the son of Ananias the high priest, a very bold youth, who was at that time governor of the temple, persuaded those that officiated in the divine service to receive no gift or sacrifice for any foreigner. And this was the true beginning of our war with the Romans : for they rejected the sacrifice of Caesar on this account: and when many of the high priests and principal men besought them not to omit the sacrifice, which it was customary for them to offer for their princes, they would not be prevailed upon. These relied much upon their multitude, for the most flourishing part of the innovators assisted them; but they had the chief regard to Eleazar, the governor of the temple. 3. Hereupon the men of power got together, and confered with the high priests, as did also the principal of the Pharisees; and thinking all was at stake, and that their calamities were becoming incurable, took counsel what was to be done. Accordingly, they determined to try what they could do with the seditious by words, and assembled the people before the brazen gate, which was that gate of the inner temple [court of the priests] which looked towards the sunrising. And, in the first place, they shewed the great indignation they had at this attempt for a revolt, and for their bringing so great a war upon their country: after which they confuted their pretence as unjustifiable, and told them, that their forefathers had adorned their temple in great part with donations bestowed on them by foreigners, and had always received what had been presented to them from foreign nations; and that they had been so far from rejecting any person's sacrifice, (which would be the highest instance of impiety,) that they had themselves placed those donations about the temple which were still visible, and had remained there so long a time: that they did now irritate the Romans to take arms against them, and invited them to make war upon them, and brought up novel rules of strange divine worship, and determined to run the hazard of having their city condemned for impiety, while they would not allow any foreigners but Jews only, either to sacrifice or worship therein. And if such a law should ever be introduced in the case of a single person only, he would have indignation at it, as an instance of inhumanity determined against him; while they have no regard to the Romans or to Caesar, and forbade even their oblations to be received also; that however they cannot but fear, lest, by thus rejecting their sacrifices, they shall not be allowed to offer their own; and that this city will lose its principality, unless they grow wiser quickly, and restore the sacrifices as formerly; and indeed amend the injury [they have offered to foreigners,] before the report of it comes to the ears of those that have been injured. 4. And as they said these things, they produced those priests that were skilful in the customs of their country, who made the report, that all their forefathers had received the sacrifices from foreign nations. - But still not one of the innovators would hearken to what was said; nay, those that ministered about the temple would not attend their divine service, but were preparing matters for beginning the war. So the men of power, perceiving that the sedition was too hard for them to subdue, and that the danger which would arise from the Romans would come upon them first of all, endeavored to save themselves, and sent ambassadors; some to Florus, the chief of whom was Simon the son of Ananias; and others to Agrippa, among whom the most eminent was Saul, and Antipas, and Costobarus, who were of the king's kindred; and they desired of them both that they would come with an army to the city, and cut off the sedition before it should be too hard to be subdued. Now this terrible message was good news to Florus; and because his design was to have a war kindled, he gave the ambassadors no answer at all. But Agrippa was equally solicitous for those that were revolting, and for those against whom the war was to be made, and was desirous to preserve the Jews for the Romans, and the temple and metropolis for the Jews; he was also sensible that it was not for his own advantage that the disturbances should proceed; so he sent three thousand horsemen to the assistance of the people out of Auranitis, and Batanea, and Trachonitis, and these under Darius, the master of his horse; and Phillip the son of Jacimus, the general of his army. 2. However, the Syrians were even (equal) with the Jews in the multitude of the men whom they slew ; for they killed those whom they caught in the cities, and that not only out of the hatred they bare them, as formerly, but to prevent the danger under which they were from them; so that the disorders in all Syria were terrible, and every city was divided into two armies encamped one against another, and the preservation of the one party was in the destruction of the other; so the daytime was spent in shedding blood, and the night in fear , - which was of the two the more terrible; for when the Syrians thought they had ruined the Jews, they had the Judaisers in suspicion also; and as each side did not care to slay those whom they only suspected on the other, so did they greatly fear them when they were mingled with the other, as if they were certainly foreigners. Moreover, greediness of gain was a provocation to kill the opposite party even to such as had of old appeared very mild and gentle towards them ; for they without fear plundered the effects of the slain, and carried of the spoil of those whom they slew to their own houses , as if they had been gained in a set battle; and he was esteemed a man of honour who got the greatest share, as having prevailed over the greater number of his enemies. It was then common to see cities filled with dead bodies, still lying unburied , and those of old men, mixed with infants all dead and scattered about together ; women also lay amongst them, without any covering for their nakedness: you might then see the whole province full of inexplicable calamities, while the dread of still more barbarous practices which were threatened, was everywhere greater that what had been already perpetrated. Allowed Fulfillment of Matthew 24:16? WHAT CESTIUS DID AGAINST THE JEWS; AND HOW, UPON HIS BESIEGING JERUSALEM, HE RETREATED FROM THE CITY WITHOUT ANY JUST OCCASION IN THE WORLD. AS ALSO WHAT SEVERE CALAMITIES HE UNDER WENT FROM THE JEWS IN HIS RETREAT. 6. And now it was that a horrible fear seized upon the seditious, insomuch that many of them ran out of the city, as though it were to be taken immediately; but the people upon this took courage, and where the wicked part of the city gave ground, thither did they come, in order to set open the gates, and to admit Cestius as their benefactor, who, had he but continued the siege a little longer, had certainly taken the city; but it was, I suppose, owing to the aversion God had already at the city and the sanctuary, that he was hindered from putting an end to the war that very day. 7. It then happened that Cestius was not conscious either how the besieged despaired of success, nor how courageous the people were for him; and so he recalled his soldiers from the place, and by despairing of any expectation of taking it, without having received any disgrace, he retired from the city, without any reason in the world. But when the robbers perceived this unexpected retreat of his, they resumed their courage, and ran after the hinder parts of his army, and destroyed a considerable number of both their horsemen and footmen; and now Cestius lay all night at the camp which was at Scopus; and as he went off farther next day, he thereby invited the enemy to follow him, who still fell upon the hindmost, and destroyed them; they also fell upon the flank on each side of the army, and threw darts upon them obliquely, nor durst those that were hindmost turn back upon those who wounded them behind, as imagining that the multitude of those that pursued them was immense; nor did they venture to drive away those that pressed upon them on each side, because they were heavy with their arms, and were afraid of breaking their ranks to pieces, and because they saw the Jews were light, and ready for making incursions upon them. And this was the reason why the Romans suffered greatly, without being able to revenge themselves upon their enemies; so they were galled all the way, and their ranks were put into disorder, and those that were thus put out of their ranks were slain; among whom were Priscus, the commander of the sixth legion, and Longinus, the tribune, and Emilius Secundus, the commander of a troop of horsemen. So it was not without difficulty that they got to Gabao, their former camp, and that not without the loss of a great part of their baggage. There it was that Cestius staid two days, and was in great distress to know what he should do in these circumstances; but when on the third day he saw a still much greater number of enemies, and all the parts round about him full of Jews, he understood that his delay was to his own detriment, and that if he staid any longer there, he should have still more enemies upon him. 3. Now this exit of the messengers was not known either to Ananus or to the guards, but the approach of the Idumeans wasknown to him; for as he knew of it before they came, he ordered the gates to be shut against them, and that the walls should be guarded. Yet did not he by any means think of fighting against them, but, before they came to blows, to try what persuasions would do. Accordingly, Jesus, the eldest of the high priests next to Artanus, stood upon the tower that was over against them, and said thus: "Many troubles indeed, and those of various kinds, have fallen upon this city, yet in none of them have I so much wondered at her fortune as now, when you are come to assist wicked men, and this after a manner very extraordinary; for I see that you are come to support the vilest of men against us, and this with so great alacrity, as you could hardly put on the like, in case our metropolis had called you to her assistance against barbarians. And if I had perceived that your army was composed of men like unto those who invited them, I had not deemed your attempt so absurd; for nothing does so much cement the minds of men together as the alliance there is between their manners. But now for these men who have invited you, if you were to examine them one by one, every one of them would be found to have deserved ten thousand deaths; for the very rascality and offscouring of the whole country, who have spent in debauchery their own substance, and, by way of trial beforehand, have madly plundered the neighboring villages and cities, in the upshot of all, have privately run together into this holy city. They are robbers, who by their prodigious wickedness have profaned this most sacred floor, and who are to be now seen drinking themselves drunk in the sanctuary, and expending the spoils of those whom they have slaughtered upon their unsatiable bellies. As for the multitude that is with you, one may see them so decently adorned in their armor, as it would become them to be had their metropolis called them to her assistance against foreigners. What can a man call this procedure of yours but the sport of fortune, when he sees a whole nation coming to protect a sink of wicked wretches? I have for a good while been in doubt what it could possibly be that should move you to do this so suddenly; because certainly you would not take on your armor on the behalf of robbers, and against a people of kin to you, without some very great cause for your so doing. But we have an item that the Romans are pretended, and that we are supposed to be going to betray this city to them; for some of your men have lately made a clamor about those matters, and have said they are come to set their metropolis free. Now we cannot but admire at these wretches in their devising such a lie as this against us; for they knew there was no other way to irritate against us men that were naturally desirous of liberty, and on that account the best disposed to fight against foreign enemies, but by framing a tale as if we were going to betray that most desirable thing, liberty. But you ought to consider what sort of people they are that raise this calumny, and against what sort of people that calumny is raised, and to gather the truth of things, not by fictitious speeches, but out of the actions of both parties; for what occasion is there for us to sell ourselves to the Romans, while it was in our power not to have revolted from them at the first, or when we had once revolted, to have returned under their dominion again, and this while the neighboring countries were not yet laid waste? whereas it is not an easy thing to be reconciled to the Romans, if we were desirous of it, now they have subdued Galilee, and are thereby become proud and insolent; and to endeavor to please them at the time when they are so near us, would bring such a reproach upon us as were worse than death. As for myself, indeed, I should have preferred peace with them before death; but now we have once made war upon them, and fought with them, I prefer death, with reputation, before living in captivity under them. But further, whether do they pretend that we, who are the rulers of the people, have sent thus privately to the Romans, or hath it been done by the common suffrages of the people? If it be ourselves only that have done it, let them name those friends of ours that have been sent, as our servants, to manage this treachery. Hath any one been caught as he went out on this errand, or seized upon as he came back? Are they in possession of our letters? How could we be concealed from such a vast number of our fellow citizens, among whom we are conversant every hour, while what is done privately in the country is, it seems, known by the zealots, who are but few in number, and under confinement also, and are not able to come out of the temple into the city. Is this the first time that they are become sensible how they ought to be punished for their insolent actions? For while these men were free from the fear they are now under, there was no suspicion raised that any of us were traitors. But if they lay this charge against the people, this must have been done at a public consultation, and not one of the people must have dissented from the rest of the assembly; in which case the public fame of this matter would have come to you sooner than any particular indication. But how could that be? Must there not then have been ambassadors sent to confirm the agreements? And let them tell us who this ambassador was that was ordained for that purpose. But this is no other than a pretense of such men as are loath to die, and are laboring to escape those punishments that hang over them; for if fate had determined that this city was to be betrayed into its enemies' hands, no other than these men that accuse us falsely could have the impudence to do it, there being no wickedness wanting to complete their impudent practices but this only, that they become traitors. And now you Idumeans are come hither already with your arms, it is your duty, in the first place, to be assisting to your metropolis, and to join with us in cutting off those tyrants that have infringed the rules of our regular tribunals, that have trampled upon our laws, and made their swords the arbitrators of right and wrong; for they have seized upon men of great eminence, and under no accusation, as they stood in the midst of the market-place, and tortured them with putting them into bonds, and, without bearing to hear what they had to say, or what supplications they made, they destroyed them. You may, if you please, come into the city, though not in the way of war, and take a view of the marks still remaining of what I now say, and may see the houses that have been depopulated by their rapacious hands, with those wives and families that are in black, mourning for their slaughtered relations; as also you may hear their groans and lamentations all the city over; for there is nobody but hath tasted of the incursions of these profane wretches, who have proceeded to that degree of madness, as not only to have transferred their impudent robberies out of the country, and the remote cities, into this city, the very face and head of the whole nation, but out of the city into the temple also; for that is now made their receptacle and refuge, and the fountain-head whence their preparations are made against us. And this place, which is adored by the habitable world, and honored by such as only know it by report, as far as the ends of the earth, is trampled upon by these wild beasts born among ourselves. They now triumph in the desperate condition they are already in, when they hear that one people is going to fight against another people, and one city against another city, and that your nation hath gotten an army together against its own bowels. Instead of which procedure, it were highly fit and reasonable, as I said before, for you to join with us in cutting off these wretches, and in particular to be revenged on them for putting this very cheat upon you; I mean, for having the impudence to invite you to assist them, of whom they ought to have stood in fear, as ready to punish them. But if you have some regard to these men's invitation of you, yet may you lay aside your arms, and come into the city under the notion of our kindred, and take upon you a middle name between that of auxiliaries and of enemies, and so become judges in this case. However, consider what these men will gain by being called into judgment before you, for such undeniable and such flagrant crimes, who would not vouchsafe to hear such as had no accusations laid against them to speak a word for themselves. However, let them gain this advantage by your coming. But still, if you will neither take our part in that indignation we have at these men, nor judge between us, the third thing I have to propose is this, that you let us both alone, and neither insult upon our calamities, nor abide with these plotters against their metropolis; for though you should have ever so great a suspicion that some of us have discoursed with the Romans, it is in your power to watch the passages into the city; and in case any thing that we have been accused of is brought to light, then to come and defend your metropolis, and to inflict punishment on those that are found guilty; for the enemy cannot prevent you who are so near to the city. But if, after all, none of these proposals seem acceptable and moderate, do not you wonder that the gates are shut against you, while you bear your arms about you." The Wickedness and Perversions of the Seditious Jews. Fulfillment of Prophecy Regarding Bloody Bodies Of Water. 6. Now, this destruction that fell upon the Jews, as it was not inferior to any of the rest in itself, so did it still appear greater than it really was; and this, because not only the whole of the country through which they had fled was filled with slaughter, and Jordan could not be passed over, by reason of the dead bodies that were in it, but because the Lake Asphaltitis was also full of dead bodies, that were carried down into it by the river. And now, Placidus, after this good success that he had, fell violently upon the neighbouring smaller cities and villages; when he took Abila, and Julias, and Bezemoth, and all those that lay as far as the lake Asphaltitis, and put such of the deserters into each of them as he though proper. He then put his soldiers on board the ships, and slew such as had fled to the lake, insomuch that all Perea had either surrendered themselves, or were taken by the Romans, as far as Macherus. The Degree of the Wickedness of this 'Untoward Generation'. 3. But now the tyrant Simon, the son of Gioras, whom the people had invited in, out of the hopes they had of his assistance in the great distresses they were in, having in his power the upper city, and a great part of the lower, did now make more vehement assaults upon John and his party, because they were fought against from above also; yet was he beneath their situation when he attacked them, as they were beneath the attacks of the others above them. Whereby it came to pass that John did both receive and inflict great damage, and that easily, as he was fought against on both sides; and the same advantage that Eleazar and his party had over him, since he was beneath them, the same advantage had he, by his higher situation, over Simon. On which account he easily repelled the attacks that were made from beneath, by the weapons thrown from their hands only; but was obliged to repel those that threw their darts from the temple above him, by his engines of war; for he had such engines as threw darts, and javelins, and stones, and that in no small number, by which he did not only defend himself from such as fought against him, but slew moreover many of the priests, as they were about their sacred ministrations. For notwithstanding these men were mad with all sorts of impiety, yet did they still admit those that desired to offer their sacrifices, although they took care to search the people of their own country beforehand, and both suspected and watched them; while they were not so much afraid of strangers, who, although they had gotten leave of them, how cruel soever they were, to come into that court, were yet often destroyed by this sedition; for those darts that were thrown by the engines came with that force, that they went over all the buildings, and reached as far as the altar, and the temple itself, and fell upon the priests, and those that were about the sacred offices; insomuch that many persons who came thither with great zeal from the ends of the earth, to offer sacrifices at this celebrated place, which was esteemed holy by all mankind, fell down before their own sacrifices themselves, and sprinkled that altar which was venerable among all men, both Greeks and Barbarians, with their own blood; till the dead bodies of strangers were mingled together with those of their own country, and those of profane persons with those of the priests, and the blood of all sorts of dead carcasses stood in lakes in the holy courts themselves. And now, "O must wretched city, what misery so great as this didst thou suffer from the Romans, when they came to purify thee from thy intestine hatred! 'For thou couldst be no longer a place fit for God, nor couldst thou long continue in being, after thou hadst been a sepulcher for the bodies of thy own people, and hadst made the holy house itself a burying-place in this civil war of thine. Yet mayst thou again grow better, if perchance thou wilt hereafter appease the anger of that God who is the author of thy destruction." But I must restrain myself from these passions by the rules of history, since this is not a proper time for domestical lamentations, but for historical narrations; I therefore return to the operations that follow in this sedition. "The direct occasion of the terrible famine"
4. And now there were three treacherous factions in the city, the one parted from the other. Eleazar and his party, that kept the sacred first-fruits, came against John in their cups. Those that were with John plundered the populace, and went out with zeal against Simon. This Simon had his supply of provisions from the city, in opposition to the seditious. When, therefore, John was assaulted on both sides, he made his men turn about, throwing his darts upon those citizens that came up against him, from the cloisters he had in his possession, while he opposed those that attacked him from the temple by engines of war; and if at any time he was freed from those that were above him, which happened frequently, from their being drunk and tired, he sallied out with a great number upon Simon and his party; and this he did always in such parts of the city as he could come at, till he set on fire those houses that were full of corn, and of all provisions. * The same thing was done by Simon, when, upon the others' retreat, he attacked the city also; as if they had, on purpose done it to serve the Romans, by destroying what the city had laid up against the Siege, and by thus cutting off the nerves of their own power. Accordingly, it so came to pass, that all the places that were about the temple were burnt down, and were become an intermediate desert space, ready for fighting on both sides; and that almost all the corn was burnt, which would have been sufficient for a siege of many years. So they were taken by the means of famine, which it was impossible they should have been, unless they had thus prepared the way for it by this procedure. 6. Thus did John hope to be too hard for his enemies by these engines constructed by his impiety; but God himself demonstrated that his pains would prove of no use to him, by bringing the Romans upon him, before he had reared any of his towers; for Titus, when he had gotten together part of his forces about him, and had ordered the rest to meet him at Jerusalem, marched out of Cesarea. He had with him those three legions that had accompanied his father when he laid Judea waste, together with that twelfth legion which had been formerly beaten with Cestius; which legion, as it was otherwise remarkable for its valor, so did it march on now with greater alacrity to avenge themselves on the Jews, as remembering what they had formerly suffered from them. Of these legions he ordered the fifth to meet him, by going through Emmaus, and the tenth to go up by Jericho; he also moved himself, together with the rest; besides whom, marched those auxiliaries that came from the kings, being now more in number than before, together with a considerable number that came to his assistance from Syria. Those also that had been selected out of these four legions, and sent with Mucianus to Italy, had their places filled up out of these soldiers that came out of Egypt with Titus; who were two thousand men, chosen out of the armies at Alexandria. There followed him also three thousand drawn from those that guarded the river Euphrates ; as also there came Tiberius Alexander, who was a friend of his, most valuable, both for his good-will to him, and for his prudence. He had formerly been governor of Alexandria, but was now thought worthy to be general of the army [under Titus]. The reason of this was, that he had been the first who encouraged Vespasian very lately to accept this his new dominion, and joined himself to him with great fidelity, when things were uncertain, and fortune had not yet declared for him. He also followed Titus as a counselor, very useful to him in this war, both by his age and skill in such affairs. 1. NOW, as Titus was upon his march into the enemy's country, the auxiliaries that were sent by the kings marched first, having all the other auxiliaries with them; after whom followed those that were to prepare the roads and measure out the camp; then came the commander's baggage, and after that the other soldiers, who were completely armed to support them; then came Titus himself, having with him another select body; and then came the pikemen; after whom came the horse belonging to that legion. All these came before the engines; and after these engines came the tribunes and the leaders of the cohorts, with their select bodies; after these came the ensigns, with the eagle ; and before those ensigns came the trumpeters belonging to them; next these came the main body of the army in their ranks, every rank being six deep; the servants belonging to every legion came after these; and before these last their baggage; the mercenaries came last, and those that guarded them brought up the rear. Now Titus, according to the Roman usage, went in the front of the army after a decent manner, and marched through Samaria to Gophna, a city that had been formerly taken by his father, and was then garrisoned by Roman soldiers; and when he had lodged there one night, he marched on in the morning; and when he had gone as far as a day's march, he pitched his camp at that valley which the Jews, in their own tongue, call "the Valley of Thorns," near a certain village called Gabaothsath, which signifies "the Hill of Saul," being distant from Jerusalem about thirty furlongs. There it was that he chose out six hundred select horsemen, and went to take a view of the city, to observe what strength it was of, and how courageous the Jews were; whether, when they saw him, and before they came to a direct battle, they would be affrighted and submit; for he had been informed what was really true, that the people who were fallen under the power of the seditious and the robbers were greatly desirous of peace; but being too weak to rise up against the rest, they lay still. Titus Referred to as "King" or "Caesar"
2. Now, so long as he rode along the straight road which led to the wall of the city, nobody appeared out of the gates; but when he went out of that road, and declined towards the tower Psephinus, and led the band of horsemen obliquely, an immense number of the Jews leaped out suddenly at the towers called the "Women's Towers," through that gate which was over against the monuments of queen Helena, and intercepted his horse; and standing directly opposite to those that still ran along the road, hindered them from joining those that had declined out of it. They intercepted Titus also, with a few other. Now it was here impossible for him to go forward, because all the places had trenches dug in them from the wall, to preserve the gardens round about, and were full of gardens obliquely situated, and of many hedges; and to return back to his own men, he saw it was also impossible, by reason of the multitude of the enemies that lay between them; many of whom did not so much as know that the king was in any danger, but supposed him still among them. So he perceived that his preservation must be wholly owing to his own courage, and turned his horse about, and cried out aloud to those that were about him to follow him, and ran with violence into the midst of his enemies, in order to force his way through them to his own men. And hence we may principally learn, that both the success of wars, and the dangers that kings are in, are under the providence of God; for while such a number of darts were thrown at Titus, when he had neither his head-piece on, nor his breastplate, (for, as I told you, he went out not to fight, but to view the city,) none of them touched his body, but went aside without hurting him; as if all of them missed him on purpose, and only made a noise as they passed by him. So he diverted those perpetually with his sword that came on his side, and overturned many of those that directly met him, and made his horse ride over those that were overthrown. The enemy indeed made a shout at the boldness of Caesar, and exhorted one another to rush upon him. Yet did these against whom he marched fly away, and go off from him in great numbers; while those that were in the same danger with him kept up close to him, though they were wounded both on their backs and on their sides; for they had each of them but this one hope of escaping, if they could assist Titus in opening himself a way, that he might not be encompassed round by his enemies before he got away from them. Now there were two of those that were with him, but at some distance; the one of which the enemy compassed round, and slew him with their darts, and his horse also; but the other they slew as he leaped down from his horse, and carried off his horse with them. But Titus escaped with the rest, and came safe to the camp. So this success of the Jews' first attack raised their minds, and gave them an ill-grounded hope; and this short inclination of fortune, on their side, made them very courageous for the future. Titus and Army Encamped Upon Mount Olivet! 3. But now, as soon as that legion that had been at Emmaus was joined to Caesar at night, he removed thence, when it was day, and came to a place called Seopus; from whence the city began already to be seen, and a plain view might be taken of the great temple. Accordingly, this place, on the north quarter of the city, and joining thereto, was a plain, and very properly named Scopus, [the prospect,] and was no more than seven furlongs distant from it. And here it was that Titus ordered a camp to be fortified for two legions that were to be together; but ordered another camp to be fortified, at three furlongs farther distance behind them, for the fifth legion; for he thought that, by marching in the night, they might be tired, and might deserve to be covered from the enemy, and with less fear might fortify themselves; and as these were now beginning to build, the tenth legion, who came through Jericho, was already come to the place, where a certain party of armed men had formerly lain, to guard that pass into the city, and had been taken before by Vespasian. These legions had orders to encamp at the distance of six furlongs from Jerusalem, at the mount called the Mount of Olives which lies over against the city on the east side, and is parted from it by a deep valley, interposed between them, which is named Cedron. 1. AS now the war abroad ceased for a while, the sedition within was revived; and on the feast of unleavened bread, which was now come, it being the fourteenth day of the month Xanthicus, [Nisan,] when it is believed the Jews were first freed from the Egyptians, Eleazar and his party opened the gates of this [inmost court of the] temple, and admitted such of the people as were desirous to worship God into it. But John made use of this festival as a cloak for his treacherous designs, and armed the most inconsiderable of his own party, the greater part of whom were not purified, with weapons concealed under their garments, and sent them with great zeal into the temple, in order to seize upon it; which armed men, when they were gotten in, threw their garments away, and presently appeared in their armor. Upon which there was a very great disorder and disturbance about the holy house; while the people, who had no concern in the sedition, supposed that this assault was made against all without distinction, as the zealots thought it was made against themselves only. So these left off guarding the gates any longer, and leaped down from their battlements before they came to an engagement, and fled away into the subterranean caverns of the temple; while the people that stood trembling at the altar, and about the holy house, were rolled on heaps together, and trampled upon, and were beaten both with wooden and with iron weapons without mercy. Such also as had differences with others slew many persons that were quiet, out of their own private enmity and hatred, as if they were opposite to the seditious; and all those that had formerly offended any of these plotters were now known, and were now led away to the slaughter; and when they had done abundance of horrid mischief to the guiltless, they granted a truce to the guilty, and let those go off that came cut of the caverns. These followers of John also did now seize upon this inner temple, and upon all the warlike engines therein, and then ventured to oppose Simon. And thus that sedition, which had been divided into three factions, was now reduced to two. "the just vengeance taken on them by the Romans." 1. Now the warlike men that were in the city, and the multitude of the seditious that were with Simon, were ten thousand, besides the Idumeans. Those ten thousand had fifty commanders, over whom this Simon was supreme. The Idumeans that paid him homage were five thousand, and had eight commanders, among whom those of the greatest fame were Jacob, the son of Sosas, and Simon, the son of Cathlas. John, who had seized upon the temple, had six thousand armed men, under twenty commanders; the zealots also that had come over to him, and left off their opposition, were two thousand four hundred, and had the same commander they had formerly, Eleazar, together with Simon, the son of Arinus. Now, while these factions fought one against another, the people were their prey of both sides, as we have said already; and that part of the people who would not join with them in their wicked practices, were plundered by both factions. Simon held the upper city, and the great walls as far as Cedron, and as much of the old wall as bent from Siloam to the east, and which went down to the palace of Monobazus, who was king of the Adiabeni, beyond Euphrates; he also held the fountain, and the Acra, which was no other than the lower city; he also held all that reached to the palace of queen Helena, the mother of Monobazus; but John held the temple, and the parts thereto adjoining, for a great way, as also Ophla, and the valley called "Valley of Cedron;" and when the parts that were interposed between their possessions were burnt by them, they left a space wherein they might fight with each other; for this internal sedition did not cease, even when the Romans were encamped near their very walls. But although they had grown wiser at the first onset the Romans made upon them, this lasted but for a while; for they returned to their former madness, and separated one from another, and fought it out, and did everything that the besiegers could desire them to do; for they never suffered anything that was worse from the Romans than they made each other suffer ; nor was there any misery endured by the city after these men's actions that could be esteemed new. But it was most of all unhappy before it was overthrown, while those that took it did it a greater kindness; for I venture to affirm, that the sedition destroyed the city, and the Romans destroyed the sedition, which it was a much harder thing to do that to destroy the walls; so that we may justly ascribe our misfortunes to our own people , and the just vengeance taken on them by the Romans; as to which matter let every one determine by the actions on both sides. Clear Fulfillment of Revelation 16:21? 3. However, John stayed behind, out of his fear of Simon, even while his own men were earnest in making a sally upon their enemies without. Yet did not Simon lie still, for he lay near the place of the siege; he brought his engines of war, and disposed of them at due distances upon the wall, both those which they took from Cestius formerly, and those which they got when they seized the garrison that lay in the tower Antonia. But though they had these engines in their possession, they had so little skill in using them, that they were in great measure useless to them; but a few there were who had been taught by deserters how to use them, which they did use, though after an awkward manner. So they cast stones and arrows at those that were making the banks; they also ran out upon them by companies, and fought with them. Now those that were at work covered themselves with hurdles spread over their banks, and their engines were opposed to them when they made their excursions. The engines, that all the legions had ready prepared for them, were admirably contrived; but still more extraordinary ones belonged to the tenth legion: those that threw darts and those that threw stones were more forcible and larger than the rest, by which they not only repelled the excursions of the Jews, but drove those away that were upon the walls also. Now the stones that were cast were of the weight of a talent , and were carried two furlongs and further. The blow they gave was no way to be sustained, not only by those that stood first in the way, but by those that were beyond them for a great space. As for the Jews, they at first watched the coming of the stone, for it was of a white color, and could therefore not only be perceived by the great noise it made, but could be seen also before it came by its brightness; accordingly the watchmen that sat upon the towers gave them notice when the engine was let go, and the stone came from it, and cried out aloud, in their own country language, THE STONE COMETH so those that were in its way stood off, and threw themselves down upon the ground; by which means, and by their thus guarding themselves, the stone fell down and did them no harm. But the Romans contrived how to prevent that by blacking the stone, who then could aim at them with success, when the stone was not discerned beforehand, as it had been till then; and so they destroyed many of them at one blow. Yet did not the Jews, under all this distress, permit the Romans to raise their banks in quiet; but they shrewdly and boldly exerted themselves, and repelled them both by night and by day. 4. While Josephus was making this exhortation to the Jews, many of them jested upon him from the wall, and many reproached him; nay, some threw their darts at him: but when he could not himself persuade them by such open good advice, he betook himself to the histories belonging to their own nation, and cried out aloud, O miserable creatures! are you so unmindful of those that used to assist you, that you will fight by your weapons and by your hands against the Romans? When did we ever conquer any other nation by such means? and when was it that God, who is the Creator of the Jewish people, did not avenge them when they had been injured? Will not you turn again, and look back, and consider whence it is that you fight with such violence, and how great a Supporter you have profanely abused? Will not you recall to mind the prodigious things done for your forefathers and this holy place, and how great enemies of yours were by him subdued under you? I even tremble myself in declaring the works of God before your ears, that are unworthy to hear them; however, hearken to me, that you may be informed how you fight not only against the Romans, but against God himself. In old times there was one Necao, king of Egypt, who was also called Pharaoh; he came with a prodigious army of soldiers, and seized queen Sarah, the mother of our nation. What did Abraham our progenitor then do? Did he defend himself from this injurious person by war, although he had three hundred and eighteen captains under him, and an immense army under each of them? Indeed he deemed them to be no number at all without God's assistance, and only spread out his hands towards this holy place, which you have now polluted, and reckoned upon him as upon his invincible supporter, instead of his own army. Was not our queen sent back, without any defilement, to her husband, the very next evening? - while the king of Egypt fled away, adoring this place which you have defiled by shedding thereon the blood of your own countrymen; and he also trembled at those visions which he saw in the night season, and bestowed both silver and gold on the Hebrews, as on a people beloved by God. Shall I say nothing, or shall I mention the removal of our fathers into Egypt, who, when they were used tyrannically, and were fallen under the power of foreign kings for four hundred ears together, and might have defended themselves by war and by fighting, did yet do nothing but commit themselves to God! Who is there that does not know that Egypt was overrun with all sorts of wild beasts, and consumed by all sorts of distempers? how their land did not bring forth its fruit? how the Nile failed of water? how the ten plagues of Egypt followed one upon another? and how by those means our fathers were sent away under a guard, without any bloodshed, and without running any dangers, because God conducted them as his peculiar servants? ..It was God who then became our General, and accomplished these great things for our fathers, and this because they did not meddle with war and fighting, but committed it to him to judge about their affairs. ...And, to speak in general, we can produce no example wherein our fathers got any success by war, or failed of success when without war they committed themselves to God. When they stayed at home, they conquered, as pleased their Judge; but when they went out to fight, they were always disappointed: for example, when the king of Babylon besieged this very city, and our king Zedekiah fought against him, contrary to what predictions were made to him by Jeremiah the prophet, he was at once taken prisoner, and saw the city and the temple demolished. Yet how much greater was the moderation of that king, than is that of your present governors, and that of the people then under him, than is that of you at this time! for when Jeremiah cried out aloud, how very angry God was at them, because of their transgressions, and told them they should be taken prisoners, unless they would surrender up their city, neither did the king nor the people put him to death; but for you, (to pass over what you have done within the city, which I am not able to describe as your wickedness deserves,) you abuse me, and throw darts at me, who only exhort you to save yourselves, as being provoked when you are put in mind of your sins, and cannot bear the very mention of those crimes which you every day perpetrate. For another example, when Antiochus, who was called Epiphanes, lay before this city, and had been guilty of many indignities against God, and our forefathers met him in arms, they then were slain in the battle, this city was plundered by our enemies, and our sanctuary made desolate for three years and six months . And what need I bring any more examples? Thus it appears that arms were never given to our nation, but that we are always given up to be fought against, and to be taken; for I suppose that such as inhabit this holy place ought to commit the disposal of all things to God, and then only to disregard the assistance of men when they resign themselves up to their Arbitrator, who is above. As for you, what have you done of those things that are recommended by our legislator? and what have you not done of those things that he hath condemned? How much more impious are you than those who were so quickly taken! You have not avoided so much as those sins that are usually done in secret; I mean thefts, and treacherous plots against men, and adulteries. You are quarrelling about rapines and murders, and invent strange ways of wickedness. Nay, the temple itself is become the receptacle of all, and this Divine place is polluted by the hands of those of our own country; which place hath yet been reverenced by the Romans when it was at a distance from them, when they have suffered many of their own customs to give place to our law. And, after all this, do you expect Him whom you have so impiously abused to be your supporter? To be sure then you have a right to be petitioners, and to call upon Him to assist you, so pure are your hands! And it is plain madness to expect that God should appear as well disposed towards the wicked as towards the righteous, since he knows when it is proper to punish men for their sins immediately; accordingly he brake the power of the Assyrians the very first night that they pitched their camp. Wherefore, had he judged that our nation was worthy of freedom, or the Romans of punishment, he had immediately inflicted punishment upon those Romans, as he did upon the Assyrians, when Pompey began to meddle with our nation, or when after him Sosius came up against us, or when Vespasian laid waste Galilee, or, lastly, when Titus came first of all near to this city; although Magnus and Sosius did not only suffer nothing, but took the city by force; as did Vespasian go from the war he made against you to receive the empire; and as for Titus, those springs that were formerly almost dried up when they were under your power since he is come, run more plentifully than they did before; accordingly, you know that Siloam, as well as all the other springs that were without the city, did so far fail, that water was sold by distinct measures; whereas they now have such a great quantity of water for your enemies, as is sufficient not only for drink both for themselves and their cattle, but for watering their gardens also. The same wonderful sign you had also experience of formerly, when the forementioned king of Babylon made war against us, and when he took the city, and burnt the temple; while yet I believe the Jews of that age were not so impious as you are. Wherefore I cannot but suppose that God is fled out of his sanctuary, and stands on the side of those against whom you fight . Now even a man, if he be but a good man, will fly from an impure house, and will hate those that are in it; and do you persuade yourselves that God will abide with you in your iniquities, who sees all secret things, and hears what is kept most private? Now what crime is there, I pray you, that is so much as kept secret among you, or is concealed by you? nay, what is there that is not open to your very enemies? for you show your transgressions after a pompous manner, and contend one with another which of you shall be more wicked than another; and you make a public demonstration of your injustice, as if it were virtue. However, there is a place left for your preservation, if you be willing to accept of it; and God is easily reconciled to those that confess their faults, and repent of them. O hard-hearted wretches as you are! cast away all your arms, and take pity of your country already going to ruin; return from your wicked ways, and have regard to the excellency of that city which you are going to betray, to that excellent temple with the donations of so many countries in it. Who could bear to be the first that should set that temple on fire? who could be willing that these things should be no more? and what is there that can better deserve to be preserved? O insensible creatures, and more stupid than are the stones themselves! And if you cannot look at these things with discerning eyes, yet, however, have pity upon your families, and set before every one of your eyes your children, and wives, and parents, who will be gradually consumed either by famine or by war. I am sensible that this danger will extend to my mother, and wife, and to that family of mine who have been by no means ignoble, and indeed to one that hath been very eminent in old time; and perhaps you may imagine that it is on their account only that I give you this advice; if that be all, kill them; nay, take my own blood as a reward, if it may but procure your preservation; for I am ready to die, in case you will but return to a sound mind after my death. 2. But as for the richer sort, it proved all one to them whether they staid in the city, or attempted to get out of it; for they were equally destroyed in both cases; for every such person was put to death under this pretense, that they were going to desert, but in reality that the robbers might get what they had. The madness of the seditious did also increase together with their famine, and both those miseries were every day inflamed more and more; for there was no corn which any where appeared publicly, but the robbers came running into, and searched men's private houses; and then, if they found any, they tormented them, because they had denied they had any; and if they found none, they tormented them worse, because they supposed they had more carefully concealed it. The indication they made use of whether they had any or not was taken from the bodies of these miserable wretches; which, if they were in good case, they supposed they were in no want at all of food; but if they were wasted away, they walked off without searching any further; nor did they think it proper to kill such as these, because they saw they would very soon die of themselves for want of food. Many there were indeed who sold what they had for one measure; it was of wheat, if they were of the richer sort; but of barley, if they were poorer . When these had so done, they shut themselves up in the inmost rooms of their houses, and ate the corn they had gotten; some did it without grinding it, by reason of the extremity of the want they were in, and others baked bread of it, according as necessity and fear dictated to them: a table was no where laid for a distinct meal, but they snatched the bread out of the fire, half-baked, and ate it very hastily. 5. It is therefore impossible to go distinctly over every instance of these men's iniquity. I shall therefore speak my mind here at once briefly: - That neither did any other city ever suffer such miseries, nor did any age ever breed a generation more fruitful in wickedness than this was, from the beginning of the world. Finally, they brought the Hebrew nation into contempt, that they might themselves appear comparatively less impious with regard to strangers. They confessed what was true, that they were the slaves, the scum, and the spurious and abortive offspring of our nation, while they overthrew the city themselves, and forced the Romans, whether they would or no, to gain a melancholy reputation, by acting gloriously against them, and did almost draw that fire upon the temple, which they seemed to think came too slowly; and indeed when they saw that temple burning from the upper city, they were neither troubled at it, nor did they shed any tears on that account, while yet these passions were discovered among the Romans themselves; which circumstances we shall speak of hereafter in their proper place, when we come to treat of such matters. 1. 1. SO now Titus's banks were advanced a great way, notwithstanding his soldiers had been very much distressed from the wall. He then sent a party of horsemen, and ordered they should lay ambushes for those that went out into the valleys to gather food. Some of these were indeed fighting men, who were not contented with what they got by rapine; but the greater part of them were poor people, who were deterred from deserting by the concern they were under for their own relations; for they could not hope to escape away, together with their wives and children, without the knowledge of the seditious; nor could they think of leaving these relations to be slain by the robbers on their account; nay, the severity of the famine made them bold in thus going out; so nothing remained but that, when they were concealed from the robbers, they should be taken by the enemy; and when they were going to be taken, they were forced to defend themselves for fear of being punished; as after they had fought, they thought it too late to make any supplications for mercy; so they were first whipped, and then tormented with all sorts of tortures, before they died, and were then crucified before the wall of the city. This miserable procedure made Titus greatly to pity them, while they caught every day five hundred Jews; nay, some days they caught more: yet it did not appear to be safe for him to let those that were taken by force go their way, and to set a guard over so many he saw would be to make such as great deal them useless to him. The main reason why he did not forbid that cruelty was this, that he hoped the Jews might perhaps yield at that sight, out of fear lest they might themselves afterwards be liable to the same cruel treatment. So the soldiers, out of the wrath and hatred they bore the Jews, nailed those they caught, one after one way, and another after another, to the crosses, by way of jest, when their multitude was so great, that room was wanting for the crosses, and crosses wanting for the bodies. 6. But as for John, when he could no longer plunder the people, he betook himself to sacrilege, and melted down many of the sacred utensils, which had been given to the temple; as also were many of those vessels which were necessary for such as ministered about holy things, - the caldrons, the dishes, and the table; nay, he did not abstain from those pouring-vessels that were sent them by Augustus and his wife; for the Romans emperors did ever both honour and adorn this temple: whereas this man, who was a Jew, seized upon what were the donations of foreigners; and said to those that were with him, that it was proper for them to use divine things while they were fighting for the Divinity, without fear, and that such whose warfare is for the temple should live of the temple; on which account he emptied the vessels of that sacred wine and oil which the priests kept to be poured on the burnt-offerings, and which lay in the inner court of the temple, and distributed it among the multitude, who, in their anointing themselves and drinking, used [each of them] above an hin of them; and here I cannot but speak my mind, and what the concerns I am under dictates to me, and it is this: - I suppose that had the Romans made any longer delay in coming against these villains, the city would either have been swallowed up by the ground opening upon them, or been overflowed by water, or else been destroyed by such thunder as the country of Sodom perished by, for it had brought forth a generation of men much more atheistical that were those that suffered such punishments ; for by their madness it was that all the people came to be destroyed. 7. And, indeed, why do I relate these particular calamities? while Manneus, the son of Lazarus, came running to Titus at this very time, and told him that there had been carried out through that one gate, which was intrusted to his care, no fewer than a hundred and fifteen thousand eight hundred and eighty dead bodies, in the interval between the fourteenth day of the month Xanthieus, [Nisan,] when the Romans pitched their camp by the city, and the first day of the month Panemus [Tamuz]. This was itself a prodigious multitude ; and though this man was not himself set as a governor at that gate, yet was he appointed to pay the public stipend for carrying these bodies out, and so was obliged of necessity to number them, while the rest were buried by their relations; though all their burial was but this, to bring them away, and cast them out of the city. After this man there ran away to Titus many of the eminent citizens, and told him the entire number of the poor that were dead, and that no fewer than six hundred thousand were thrown out at the gates, though still the number of the rest could not be discovered; and they told him further, that when they were no longer able to carry out the dead bodies of the poor, they laid their corpses on heaps in very large houses, and shut them up therein; as also that a medimnus of wheat was sold for a talent; and that when, a while afterward, it was not possible to gather herbs, by reason the city was all walled about, some persons were driven to that terrible distress as to search the common sewers and old dunghills of cattle, and to eat the dung which they got there; and what they of old could not endure so much as to see they now used for food. When the Romans barely heard all this, they commiserated their case; while the seditious, who saw it also, did not repent, but suffered the same distress to come upon themselves; for they were blinded by that fate which was already coming upon the city, and upon themselves also. 1. Thus did the miseries of Jerusalem grow worse and worse every day, and the seditious were still more irritated by the calamities they were under, even while the famine preyed upon themselves, after it had preyed upon the people. And indeed the multitude of carcases that lay in heaps one upon another was a horrible sight, and produced a pestilential stench , which was a hinderance to those that would make sallies out of the city, and fight the enemy: but as those were to go in battle array, who had been already used to ten thousand murders, and must tread upon those dead bodies as they marched along, so were not they terrified, nor did they pity men as they marched over them: nor did they deem this affront offered to the deceased to be any ill omen to themselves; but as they had their right hands already polluted with the murders of their own countrymen, and in that condition ran out to fight with foreigners, they see to me to have cast a reproach upon God himself, as if he were too slow in punishing them; for the war was not now gone on with as if they had any hope of victory, for they gloried after a brutish manner in that despair of deliverance they were already in. And now the Romans, although they were greatly distressed in getting together their materials, raised their banks in on-and-twenty days, after they had cut down all the trees that were in the country that adjoined to the city, and that for ninety furlongs round about, as I have already related. And truly the very view itself of the country was a melancholy thing; for those places which were before adorned with trees and pleasant gardens were now become a desolate country every way, and its trees were all cut down : nor could any foreigner that had formerly seen Judea, and the most beautiful suburbs of the city, and now see it as a desert, but lament and mourn sadly at so great a change: for the was had laid all signs of beauty quite waste: nor, if any one that had known the place before had come on a sudden to it now, would have known it again; but though he were at the city itself, yet would he have inquired for it notwithstanding. The Ceasing of the "Daily Sacrifice", Fulfilling Daniel 9:27? 1. And now Titus gave orders to his soldiers that were with him to dig up the foundations of the tower of Antonia, and make him a ready passage for his army to come up; while he himself had Josephus brought to him (for he had been informed that on that very day, which was the seventeenth day* of Panemus, [Tamuz,] the sacrifice called "the Daily Sacrifice" had failed, and had not been offered to God for want of men to offer it, and that the people were grievously troubled at it) and commanded him to say the same things to John that he had said before, that if he had any malicious inclination for fighting, he might come out with as many of his men as he pleased, in order to fight, without the danger of destroying either his city or temple; but that he desired he would not defile the temple, nor thereby offend against God. That he might, if he pleased, offer the sacrifices which were now discontinued, by any of the Jews whom he should pitch upon. Upon this, Josephus stood in such a place where he might be heard, not by John only, but by many more, and then declared to them what Caesar had given him in charge, and this in the Hebrew language. So he earnestly prayed them to spare their own city, and to prevent that fire which was just ready to seize upon the temple, and to offer their usual sacrifices to God therein. At these words of his a great sadness and silence were observed among the people. But the tyrant himself cast many reproaches upon Josephus, with imprecations besides ; and at last added this withal, that he did never fear the taking of the city, because it was God's own city. In answer to which, Josephus said thus, with a loud voice : - "To be sure, thou hast kept this city wonderfully pure for God's sake! the temple also continues entirely unpolluted! Nor hast thou been guilty of impiety against him, for whose assistance thou hopest! He still receives his accustomed sacrifices! Vile wretch that thou art! If any one should deprive thee of thy daily food, thou wouldst esteem him to be an enemy to thee; but thou hopest to have that God for thy supporter in this war whom thou hast deprived of his everlasting worship! and thou imputest those sins to the Romans, who to this very time take care to have our laws observed, and almost compel these sacrifices to be still offered to God, which have by thy means been intermitted! Who is there can avoid groans and lamentations at the amazing change that is made in this city? since very foreigners and enemies do now correct that impiety which thou hast occasioned : while thou, who art a Jew, and was educated in our laws, art become a greater enemy to them than the others! But still, John, it is never dishonorable to repent, and amend what hath been done amiss, even at the last extremity. Thou hast an instance before thee in Jechoniah, the king of the Jews, if thou hast a mind to save the city, who, when the king of Babylon made war against him, did, of his own accord, go out of this city before it was taken, and did undergo a voluntary captivity with his family, that the sanctuary might not be delivered up to the enemy, and that he might not see the house of God on fire: on which account he is celebrated among all the Jews, in their sacred memorials, and his memory is become immortal, and will be conveyed fresh down to our posterity through all ages. This, John, is an excellent example in such a time of danger; and I dare venture to promise that the Romans shall still forgive thee. And take notice, that I, who make this exhortation to thee, am one of thine own nation; I, who am a Jew, do make this promise to thee. And it will become thee to consider who I am that give thee this counsel, and whence I am derived; for while I am alive I shall never be in such slavery as to forego my own kindred, or forget the laws of our forefathers. Thou hast indignation at me again, and makest a clamour at me, and reproachest me; indeed, I cannot deny but I am worthy of worse treatment than all this amounts to, because, in opposition to fate, I make this kind invitation to thee, and endeavor to force deliverance upon those whom God hath condemned. And who is there that does not know what the writings of the ancient prophets contain in them, -and particularly that oracle which is just now going to be fulfilled upon this miserable city? - for they foretold that this city should be then taken when somebody shall begin the slaughter of his own countrymen! and are not both the city and the entire temple now full of the dead bodies of your countrymen? It is God, therefore, it is God himself who is bringing on this fire, to purge that city and temple by means of the Romans, * and is going to pluck up this city, which is full of your pollutions." More Accounts of the Calamities and Fulfillments of the Prophets. 3. Now of those that perished by famine in the city, the number was prodigious, and the miseries they underwent were unspeakable ; for if so much as the shadow of any kind of food did anywhere appear , a war was commenced presently; and the dearest friends fell a-fighting one with another about it , snatching from each other the most miserable supports of life. Nor would men believe that those who were dying had no food; but the robbers would search them when they were expiring, lest any one should have concealed food in their bosoms, and counterfeited dying: nay, these robbers gaped for want, and ran about stumbling and staggering along like mad dogs, and reeling against the doors of the houses like drunken men; they would also, in the great distress they were in, rush into the very same houses two or three times in one and the same day. Moreover, their hunger was so intolerable, that it obliged them to chew everything, while they gathered such things as the most sordid animals would not touch, and endured to eat them; nor did they at length abstain from girdles and shoes; and the very leather which belonged to their shields they pulled off and gnawed : the very wisps of old hay became food to some; and some gathered up fibres, and sold a very small weight of them for four Attic, [drachmae.] But why should I describe the shameless impudence that the famine brought on men in their eating inanimate things, while I am going to relate matter of fact, the like to which no history relates, either among the Greeks or Barbarians! It is horrible to speak of it, and incredible when heard. I had indeed willingly omitted this calamity of ours, that I might not seem to deliver what is so portentous to posterity, but that I have innumerable witnesses to it in my own age; and besides, my country would have had little reason to thank me for suppressing the miseries that she underwent at this time. Fulfillment of Revelation 9:6? and Deuteronomy 28:53, 57? 4. Now there was a certain woman that dwelt beyond Jordan, her name was Mary; her father was Eleazar, of the village Bethezub, which signifies the House of Hyssop. She was eminent for her family and her wealth, and had fled away to Jerusalem with the rest of the multitude , and was with them besieged therein at this time. The other effects of this woman had been already seized upon; such I mean as she had brought with her out of Perea, and removed to the city. What she had treasured up besides, as also what food she had contrived to save, had also been carried off by the rapacious guards, who came every day running into her house for that purpose. This put the poor woman into a very great passion, and by the frequent reproaches and imprecations she cast at these rapacious villains, she had provoked them to anger against her; but none of them, either out of the indignation she had raised against herself, or out of the commiseration of her case, would take away her life ; and if she found any food, she perceived her labours were for others, and not for herself; and it was now become impossible for her any way to find any more food, while the famine pierced through her very bowels and marrow, when also her passion was fired to a degree beyond the famine itself: nor did she consult with anything but with her passion and the necessity she was in. She then attempted a most unnatural thing; and snatching up her son, who was a child sucking at her breast, she said, "O thou miserable infant! for whom shall I preserve thee in this war, this famine, and this sedition ? As to the war with the Romans, if they preserve our lives, we must be slaves! The famine also will destroy us, even before that slavery comes upon us; yet are these seditious rogues more terrible than both the other. Come on; be thou my food, and be thou a fury to these seditious varlets and a byeword to the world, which is all that is now wanting to complete the calamities of us Jews." As soon as she had said this, she slew her son; and then roasted him, and ate one half of him , and kept the other half by her concealed. Upon this the seditious come in presently, and smelling the horrid scent of this food, they threatened her that they would cut her throat immediately if she did not shew them what food she had gotten ready. She replied, that she had saved a very fine portion of it for them; and withal uncovered what was left of her son. Hereupon they were seized with a horror and amazement of mind, and stood astonished at the sight; when she said to them "This is mine own son; and what hath been done was mine own doing! Come, eat of this food; for I have eaten of it myself! Do not you pretend to be either more tender than a woman, or more compassionate than a mother; but if you be so scrupulous, and do abominate this my sacrifice, as I have eaten the one half, let the rest be reserved for me also." After which, those men went out trembling, being never so much affrighted at anything as they were at this, and with some difficulty they left the rest of that meat to the mother. Upon which, the whole city was full of horrid action immediately; and while everyone laid this miserable case before their own eyes, they trembled, as if this unheard-of-action had been done by themselves. So those that were thus distressed by the famine were very desirous to die ; and those already dead were esteemed happy, because they had not live long enough either to hear or see such miseries. Fulfillment of Many Prophecies, Including Matthew 24:2? 1. While the holy house was on fire, everything was plundered that came to hand, and ten thousand of those that were caught were slain; nor was there a commiseration of any age, or any reverence of gravity; but children, and old men, and profane persons, and priests, were all slain in the same manner; so that this war went round all sorts of men, and brought them to destruction, and as well those that made supplication for their lives, as those that defended themselves by fighting. The flame was also carried a long way, and made an echo, together with the groans of those that were slain ; and because this hill was high , and the works at the temple were very great, one would have thought that the whole city had been on fire. Nor can one imagine anything either greater or more terrible than this noise; for there was at once a shout of the Roman legions, who were marching all together, and a sad clamour of the seditious, who were now surrounded with fire and sword. The people also that were left above were beaten back upon the enemy, and under a great consternation, and made sad moans at the calamity they were under; the multitude also that was in the city joined in this outcry with those that were upon the hill; and besides many of those that were worn away by the famine, and their mouths almost closed when they saw the fire of the holy house, they exerted their utmost strength, and brake out into groans and outcries again: Perea did also return he echo, as well as the mountains round about, [the city,] and augmented the force of the entire noise. Yet was the misery itself more terrible than this disorder; for one would have thought that the hill itself, on which the temple stood, was seething-hot , as full of fire on every part of it, that the blood was larger in quantity than the fire, and those that were slain more in number that those that slew them; for the ground did nowhere appear visible, for the dead bodies that lay on it; but the soldiers went over the heaps of these bodies, as they ran upon such as fled from them. And now it was that the multitude of the robbers were thrust out [of the inner court of the temple] by the Romans, and had much ado to get into the outer court, and from thence into the city, while the remainder of the populace fled into the cloister of that outer court. As for the priests, some of them plucked up from the holy house the spikes that were upon it, with their bases, which were made of lead, and shot them at the Romans instead of darts. But then as they gained nothing by so doing, and as the fire burst out upon them, they retired to the wall that was eight cubits broad, and there they tarried; yet did two of these of eminence among them, who might have saved themselves by going over to the Romans, or have borne up with courage, and taken their fortune with the others, throw themselves into the fire, and were burnt together with the holy house; their names were Merius to son of Belgas, and Joseph the son of Daleus. 2. And now the Romans, judging that it was in vain to spare what was round the holy house, burnt all those places, as also the remains of the cloisters and the gates, two excepted; the one on the east side, and the other on the south; both which, however, they burnt afterward . They also burnt down the treasury-chambers, in which was an immense quantity of money, and an immense number of garments, and other precious goods, there reposited; and, to speak all in a few words, there it was that the entire riches of the Jews were heaped up together, while the rich people had there built themselves chambers, [to contain such furniture.] The soldiers also came to the rest of the cloisters that were in the outer [court of the] temple, whither the women and children and a great mixed multitude of the people fled, in number about six thousand. But before Caesar had determined anything about these people, or given the commanders any orders relating to them, the soldiers were in such a rage, that they set the cloister of fire; by which means it came to pass that some of these were destroyed by throwing themselves down headlong, and some were burnt in the cloisters themselves. Nor did any one of these escape with his life. A false prophet* was the occasion of these people's destruction, who had made a public proclamation in the city that very day, that God commanded them to get up upon the temple, and that there they should receive miraculous signs of their deliverance. Now, there was then a great number of false prophets suborned by the tyrants to impose upon the people, who denounced this to them, that they should wait for deliverance from God; and this was in order to keep them from deserting, and that they might be buoyed up above fear and care by such hopes. Now, a man that is in adversity does easily comply with such promises; for when such a seducer makes him believe that he shall be delivered from those miseries which oppress him, then it is that the patient is full of hopes of such deliverance . 3. Thus were the miserable people persuaded by these deceivers, and such as belied God himself; while they did not attend, nor give credit, to the signs that were so evident, and did so plainly foretell their future desolation ; but, like men infatuated, without either eyes to see or minds to consider , did not regard the denunciations that God made to them . Thus there was a star resembling a sword, which stood over the city, and a comet, that continued a whole year . Thus also, before the Jews' rebellion, and before those commotions which preceded the war, when the people were come in great crowds to the feast of unleavened bread, on the eight day of the month Xanthicus, [Nisan,] and at the ninth hour of the night, so great a light shone round the altar and the holy house, that it appeared to be bright day-time; which light lasted for half an hour . This light seemed to be a good sign to the unskilful, but was so interpreted by the sacred scribes as to portend those events that followed immediately upon it. At the same festival also, a heifer, as she was led by the high priest to be sacrificed, brought forth a lamb in the midst of the temple. Moreover, the eastern gate of the inner, [court of the temple,] which was of brass, and vastly heavy, and had been with difficulty shut by twenty men, and rested upon a basis armed with iron, and had bolts fastened very deep into the firm floor, which was there made of one entire stone, was seen to be opened of its own accord about the sixth hour of the night . Now, those that kept watch in the temple came thereupon running to the captain of the temple, and told him of it; who then came up thither, and not without great difficulty was able to shut the gate again. This also appeared to the vulgar to be a very happy prodigy, as if God did thereby open them the gate of happiness. But the men of learning understood it, that the security of their holy house was dissolved of its own accord, and that the gate was opened for the advantage of their enemies. So these publicly declared, that this signal forshewed the desolation that was coming upon them. Besides these, a few days after that feast, on the one-and-twentieth day of the month Artemisius, [Jyar,] a certain prodigious and incredible phenomenon appeared; I suppose the account of it would seem to be a fable, were it not related by those that saw it, and were not the events that followed it of so considerable a nature as to deserve such signals; for, before sun-setting, chariots and troops of soldiers in their armour were seen running about among the clouds, and surrounding of cities . Moreover, at that feast which we call Pentecost, as the priests were going by night into the inner [court of the] temple, as their custom was, to perform their sacred ministrations, they said that, in the first place, they felt a quaking , and heard a great noise, and after that they heard a sound as of a great multitude, saying, "Let us remove hence." But, what is still more terrible, there was one Jesus, the son of Ananus, a plebeian, and an husbandman, who, four years before the war began, and at a time when the city was in very great peace and prosperity , came to that feast whereon it is our custom for every one to make tabernacles to God in the temple, began on a sudden to cry aloud, "A voice from the east, a voice from the west, a voice from the four winds, a voice against Jerusalem and the holy house, a voice against the bridegrooms and the brides, and a voice against this whole people!" This was his cry, as he went about by day and by night, in all the lanes of the city. However, certain of the most eminent among the populace had great indignation at this dire cry of his, and took up the man, and gave him a great number of severe stripes; yet did not he either say anything for himself, or anything peculiar to those that chastised him, but still he went on with the same words which he cried before. Hereupon our rulers supposing, as the case proved to be, that this was a sort of divine fury in the man, brought him to the Roman procurator- where he was whipped till his bones were laid bare; yet did he not make any supplication for himself, nor shed any tears, but turning his voice to the most lamentable tone possible, at every stroke of the whip his answer was , "Woe, woe to Jerusalem!" And when Albinus (for he was then our procurator) asked him, Who he was? and whence he came? and why he uttered such words? he made no manner of reply to what he said, but still did not leave off his melancholy ditty, till Albinus took him to be a madman, and dismissed him. Now, during all the time that passed before the war began, this man did not go near any of the citizens, nor was seen by them while he said so; but he every day uttered these lamentable words, as if it were his premeditated vow, "Woe, woe to Jerusalem!" Nor did he give ill words to any of those that beat him every day, nor good words to those that gave him food; but this was his reply to all men, and indeed no other than a melancholy presage of what was to come. This cry of his was the loudest at the festivals; and he continued this ditty for seven years and five months, without growing hoarse, or being tired therewith, until the very time that he saw his presage in earnest fulfilled in our siege, when it ceased; for, as he was going round upon the wall, he cried out with his utmost force, "Woe, woe to the city again, and to the people, and to the holy house!" And just as he added at the last - "Woe, woe to myself also!" there came a stone out of one of the engines, and smote him, and killed him immediately: and as he was uttering the very same presages, he gave up the ghost. 4. Now, if any one consider these things, he will find that God takes care of mankind, by all ways possible foreshews to our race what is for their preservation; but that men perish by those miseries which they madly and voluntarily bring upon themselves; for the Jews, by demolishing the tower of Antonia , had made their temple four-square, while at the same time they had it written in their sacred oracles, - "That then should the city be taken, as well as their holy house, when once their temple should become four-square." But now, what did most elevate them in undertaking this war was an ambiguous oracle that was also found in their sacred writings, how, "about that time, one from their country should become governor of the habitable earth." The Jews took this prediction to belong to themselves in particular; and many of the wise men were thereby deceived in their determination. Now, this oracle certainly denoted the government of Vespasian, who was appointed emperor in Judea . However, it is not possible for men to avoid fate, although they see it beforehand. But these men interpreted some of these signals according to their own pleasure; and some of them they utterly despised , until their madness was demonstrated, both by the taking of their city and their own destruction." Fulfillment of Daniel 9:27; 11:31; 12:11; Matthew 24:15, 34? And Made Joyful Acclamations to Titus. 1. And now the Romans, upon the flight of the seditious into the city, and upon the burning of the holy house itself, and of all the buildings lying round about it, brought their ensigns to the temple* and set them over against its eastern gate; and there did they offer sacrifices to them, and there did they make Titus Imperator , with the greatest acclamations of joy. And now all the soldiers had such vast quantities of the spoils which they had gotten by plunder, that in Syria a pound weight of gold was sold for half its former value. 3. So now the last hope which supported the tyrants, and that crew of robbers who were with them, was in the caves and caverns under ground; whither, if they could once fly, they did not expect to be searched for; but endeavored, that after the whole city should be destroyed, and the Romans gone away, they might come out again, and escape from them. This was no better than a dream of theirs; for they were not able to lie hid either from God or from the Romans . However, they depended on these under-ground subterfuges, and set more places on fire than did the Romans themselves; and those that fled out of their houses thus set on fire into the ditches, they killed without mercy, and pillaged them also; and if they discovered food belonging to any one, they seized upon it and swallowed it down, together with their blood also; nay, they were now come to fight one with another about their plunder; and I cannot but think that, had not their destruction prevented it, their barbarity would have made them taste of even the dead bodies themselves. 2. It was at this time that the commanders of the Idumeans got privately together, and took counsel about surrendering themselves up to the Romans. Accordingly, they sent five men to Titus, and entreated him to give them his right hand for their security. So Titus, thinking that the tyrants would yield if the Idumeans, upon whom a great part of the war depended, were once withdrawn from them, after some reluctance and delay, complied with them, and gave them security for their lives, and sent the five men back; but as these Idumeans were preparing to march out, Simon perceived it, and immediately slew the five men that had gone to Titus, and took their commanders, and put them in prison, of whom the most eminent was Jacob, the son of Sosas; but as for the multitude of the Idumeans, who did not at all know what to do, now their commanders were taken from them, he had them watched, and secured the walls by a more numerous garrison. Yet could not that garrison resist those that were deserting; for although a great number of them were slain, yet were the deserters many more in number. These were all received by the Romans, because Titus himself grew negligent as to his former orders for killing them, and because the very soldiers grew weary of killing them , and because they hoped to get some money by sparing them; for they left only the populace, and sold the rest of the multitude, * with their wives and children, and every one of them at a very low price, and that because such as were sold were very many, and the buyers very few; and although Titus had made proclamation beforehand that no deserter should come alone by himself, so that they might bring out their families with them, yet did he receive such as these also. However, he set over them such as were to distinguish some from others, in order to see if any of them deserve to be punished; and indeed the number of those that were sold was immense; but of the populace above forty thousand were saved, whom Caesar let go whither every one of them pleased. 3. But now at this time it was that one of the priests, the son of Thebuthus, whose name was Jesus, upon his having security given him, by the oath of Caesar, that he should be preserved, upon condition that he should deliver to him certain of the precious things that had been reposited in the temple came out of it, and delivered him from the wall of the holy house two candlesticks, like to those that lay in the holy house, with tables, and cisterns, and vials, all made of solid gold, and very heavy. He also delivered to him the veils and the garments, with the precious stones, and a great number of other precious vessels that belonged to their sacred worship. The treasurer of the temple also, whose name was Phineas, was seized on, and showed Titus the coats and girdles of the priests, with a great quantity of purple and scarlet, which were there reposited for the uses of the veil, as also a great deal of cinnamon and cassia, with a large quantity of other sweet spices, (30) which used to be mixed together, and offered as incense to God every day. A great many other treasures were also delivered to him, with sacred ornaments of the temple not a few; which things thus delivered to Titus obtained of him for this man the same pardon that he had allowed to such as deserted of their own accord. 2. And now, since his soldiers were already quite tired with killing men, and yet there appeared to be a vast multitude still remaining alive, Caesar gave orders that they should kill none but those that were in arms, and opposed them, but should take the rest alive. But, together with those whom they had orders to slay, they slew the aged and the infirm; but for those that were in their flourishing age, and who might be useful to them, they drove them together into the temple, and shut them up within the walls of the court of the women; over which Caesar set one of his freed-men, as also Fronto, one of his own friends; which last was to determine every one's fate, according to his merits. So this Fronto slew all those that had been seditious and robbers, who were impeached one by another; but of the young men he chose out the tallest and most beautiful, and reserved them for the triumph; and as for the rest of the multitude that were above seventeen years old, he put them into bonds, and sent them to the Egyptian mines Titus also sent a great number into the provinces, as a present to them, that they might be destroyed upon their theatres, by the sword and by the wild beasts; but those that were under seventeen years of age were sold for slaves. Now during the days wherein Fronto was distinguishing these men, there perished, for want of food, eleven thousand; some of whom did not taste any food, through the hatred their guards bore to them; and others would not take in any when it was given them. The multitude also was so very great, that they were in want even of corn for their sustenance. The Number Of Captives, And Of Those That Perished In The Siege. 3. Now the number of those that were carried captive during the whole war was collected to be ninety-seven thousand ; as was the number of those that perished during the whole siege, eleven hundred thousand * , the greater part of whom were indeed of the same nation, [with the citizens of Jerusalem,] but not belonging to the city itself; for they were come up from all the country to the feast of unleavened bread, and were on a sudden shut up by an army , which, at the very first, occasioned so great a straitness among them, that there came a pestilential destruction upon them, and soon afterward such a famine as destroyed them more suddenly. And that this city could contain so many people in it is manifest by that number of them which was taken under Cestius, who being desirous of informing Nero of the power of the city, who otherwise was disposed to contemn that nation, entreated the high priests, if the thing were possible, to take the number of their whole multitude. So these high priests, upon the coming of their feast which is called the Passover, when they slay their sacrifices, from the ninth hour to the eleventh, but so that a company not less than belong to every sacrifice, (for it is not lawful for them to feast singly by themselves,) and many of us are twenty in a company, found the number of sacrifices was two hundred and fifty-six thousand five hundred; which, upon the allowance of no more than ten that feast together, amounts to two millions seven hundred thousand and two hundred persons that were pure and holy; for as to those that have the leprosy, or the gonorrhea, or women that have their monthly courses, or such as are otherwise polluted, it is not lawful for them to be partakers of this sacrifice; nor indeed for any foreigners neither, who come hither to worship. 1. And thus was Jerusalem taken, in the second year of the reign of Vespasian, on the eight day of the month Gorpieus [Elu]. It had been taken five* times before, though this was the second time of its desolation ; for Shishak, the king of Egypt, and after his Antiochus, and after him Pompey, and after him Sosius and Herod took the city, but still preserved it; but before all these, the king of Babylon conquered it, and made it desolate, one thousand four hundred and sixty-eight years and six months after it was built. But he who first built it was a potent man among the Canaanites, and is in our tongue called [Melchizedek] the Righteous King, for such he really was; on which account he was [there] the first priest of God, and first built a temple, [there,] and called the city Jerusalem, which was formerly called Salem. However, David, the king of the Jews, ejected the Canaanites, and settled his own people therein. It was demolished entirely by the Babylonians, four hundred and seventy-seven years and six months after him. And from king David, who was the first of the Jews who reigned therein, to this destruction under Titus, were one thousand one hundred and seventy-nine years; but from its first building, till this last destruction, were two thousand one hundred and seventy-seven years; yet hath not its great antiquity, nor its vast riches, nor the diffusion of its nation over all the habitable earth, nor the greatness of the veneration paid to it on a religious account, been sufficient to preserve it from being destroyed. And thus ended the siege of Jerusalem. 1. NOW at the same time that Titus Caesar lay at the siege of Jerusalem, did Vespasian go on board a merchantship and sailed from Alexandria to Rhodes; whence he sailed away, in ships with three rows of oars; and as he touched at several cities that lay in his road, he was joyfully received by them all, and so passed over from Ionia into Greece; whence he set sail from Corcyra to the promontory of Iapyx, whence he took his journey by land. But as for Titus, he marched from that Cesarea which lay by the sea-side, and came to that which is named Cesarea Philippi, and staid there a considerable time, and exhibited all sorts of shows there. And here a great number of the captives were destroyed, some being thrown to wild beasts, and others in multitudes forced to kill one another, as if they were their enemies. And here it was that Titus was informed of the seizure of Simon the son of Gioras, which was made after the manner following: This Simon, during the siege of Jerusalem, was in the upper city; but when the Roman army was gotten within the walls, and were laying the city waste, he then took the most faithful of his friends with him, and among them some that were stone-cutters, with those iron tools which belonged to their occupation, and as great a quantity of provisions as would suffice them for a long time, and let himself and all them down into a certain subterraneous cavern that was not visible above ground. Now, so far as had been digged of old, they went onward along it without disturbance; but where they met with solid earth, they dug a mine under ground, and this in hopes that they should be able to proceed so far as to rise from under ground in a safe place, and by that means escape. But when they came to make the experiment, they were disappointed of their hope; for the miners could make but small progress, and that with difficulty also; insomuch that their provisions, though they distributed them by measure, began to fail them. And now Simon, thinking he might be able to astonish and elude the Romans, put on a white frock, and buttoned upon him a purple cloak, and appeared out of the ground in the place where the temple had formerly been. At the first, indeed, those that saw him were greatly astonished, and stood still where they were; but afterward they came nearer to him, and asked him who he was. Now Simon would not tell them, but bid them call for their captain; and when they ran to call him, Terentius Rufus who was left to command the army there, came to Simon, and learned of him the whole truth, and kept him in bonds, and let Caesar know that he was taken. Thus did God bring this man to be punished for what bitter and savage tyranny he had exercised against his countrymen by those who were his worst enemies; and this while he was not subdued by violence, but voluntarily delivered himself up to them to be punished, and that on the very same account that he had laid false accusations against many Jews, as if they were falling away to the Romans, and had barbarously slain them for wicked actions do not escape the Divine anger, nor is justice too weak to punish offenders, but in time overtakes those that transgress its laws, and inflicts its punishments upon the wicked in a manner, so much more severe, as they expected to escape it on account of their not being punished immediately. Simon was made sensible of this by falling under the indignation of the Romans. This rise of his out of the ground did also occasion the discovery of a great number of others Of the seditious at that time, who had hidden themselves under ground. But for Simon, he was brought to Caesar in bonds, when he was come back to that Cesarea which was on the seaside, who gave orders that he should be kept against that triumph which he was to celebrate at Rome upon this occasion.